One can easily moralize and judge upon his or her evil deeds. But, it is rather complicated when the person comes face-to-face and talks directly at you with bare honesty, even if the person has spilled the blood of family members for his own vain desire. Thomas Ostermeier’s Richard tells one such story. 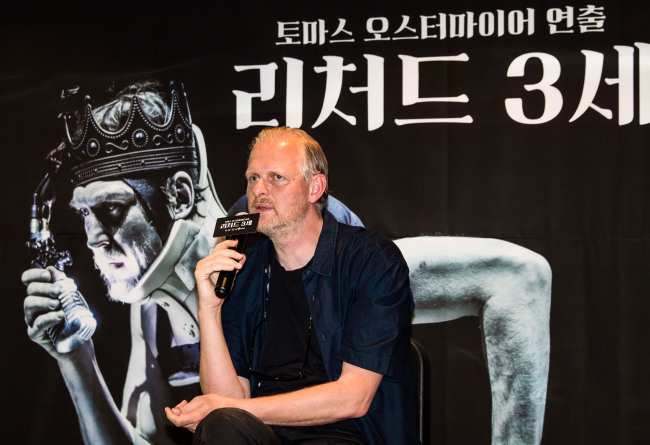 Having first premiered in Berlin in 2015, talented German director Thomas Ostermeier’s “Richard III” brought sheer-wicked, grotesque, deformed yet relatable vice in front of the eyes of the local audience Thursday at the LG Arts Center. Originally designed to be staged at a venue in Berlin specifically built to reproduce the architecture of William Shakespeare’s original Globe Theatre, where the audience sits around the stage and becomes part of the action, Ostermeier’s “Richard III” performance in Seoul also has made decent efforts to reproduce the proximity. The stage size has been modified to incorporate the semicircular shape of the Globe, while incorporating a subtitle screen in the middle of the stage so the audience doesn’t miss the performance while following along. The German-language version of “Richard III” takes off with Richard’s opening soliloquy with the backdrop of the York family’s celebrations of victory in the War of the Roses. Grasping the microphone hanging from above, Lars Eidinger beats out the stage, accompanied by discursive rock music and live drum sounds. Then on amplified is the innermost psychology of the main character throughout the play. From the very beginning of the play, born outsider Richard feels excluded -- or perhaps excluded himself -- from the Yorks and the world around him. Possessed by a sense of inferiority and anger that stems out of it, deformed outsider Richard starts to get rid of people between him and the throne. The nihilist orders deaths and terror to please his every desire. Wearing braces on his teeth, oddly shaped oversized shoes and with a hump, Richard has neither a handsome figure nor virtues to admire. But he exudes a nonetheless strong presence through his use of seductive language -- largely credited to the energetic performance of Eidinger, who dominates the stage for 2 1/2 hours of the intermission-less play, as well as the German script by Marius von Mayenburg adapted from the original Shakespeare. Richard is a vicious character capable of horrible things. Yet, he somehow draws a great deal of interest from the audience. He does so particularly by directly addressing the audience. Richard’s relationship to the audience remains very intimate throughout the play. As he jokes and directly gestures towards the audience, spectators feel as if they are part of Richard’s whole vicious scheme. Richard carries out evil actions to ascend to the throne. However, he is still left unsettled, only to confront and fight himself. As the play marches toward its conclusion, Richard begins to crack. Finishing his meal, Richard wipes the leftovers across his face. He then holds aloft his plate as a mirror, catching a glimpse of himself in a white mask. Laurie Anderson’s anti-heroic “O Superman” beats away in the background. Richard’s prepares himself for the final battle. What he is stabbing away at in the final battle, however, are foes that exist only inside his head. The oddity and uncanniness that come from Richard’s duel engulf the theatergoers. They are stuck with their anti-hero. Having participated and closely followed Richard’s misdeeds and ugly impulses, the audience is left to reflect on its judgment of Richard, and of itself. 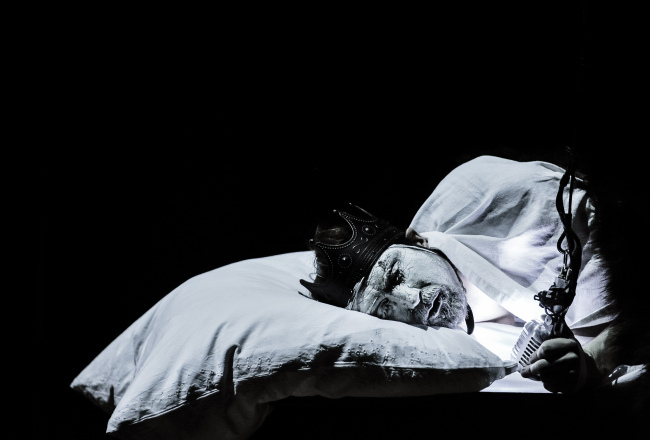 Schaubuhne Berlin’s “Richard III” runs for the first time in Korea with performances from Thursday to Sunday at LG Arts Center in Seoul. The play marks Ostermeier’s fourth visit; he first came to Korea with “Nora the Killer Doll” in 2005.